This one‐year practicum is designed to move young people toward service and community awareness while also deepening their knowledge of God’s word. Students who complete this course find themselves well prepared to effectively communicate their values in future academic and professional settings. Described as a Christian Statesman’s version of the Eagle Scout program, the Ambassador League engages the student in a year-long quest to further develop their Biblical worldview and leadership skills. Students are required to read, research, observe, and take action. They earn points toward their goal by accomplishing assignments such as word studies in Scripture, writing letters to the editor, attending local government meetings, interviewing and shadowing local leaders from various occupations, and volunteering time for non-profit organizations and campaigns. Each project is designed to develop leadership skills while applying the principles learned at LEAD. Students will receive regular “Ambassador Alerts” – an email newsletter reporting on each student’s progress. 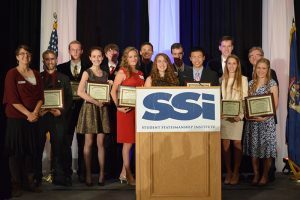 Students who complete at least 24 assignments are invited to be recognized at the SSI Annual Banquet held each fall. Those who complete all 37 assignments will receive a scholarship award as well. Each “Agent in training” is required to find a mentor to meet with six times throughout the year. Promoting LEAD to a group and writing a report of personal experiences at LEAD are requirements of this section. The final assignment is a report on the Ambassador League experience. Theme is Freedom by M. Stanton Evans. Agents are given a variety of Biblical issues to study: Truth, Mercy and Justice, The Nature of Man, The Blessings of Ten Commandments, Lordship of Christ, Homosexuality, Sanctity of Life, Inspiration and Inerrancy of the Bible, Self-government and Self-control, Sanctity of Marriage, and Civil Government. Some of the most interesting activities in which the agents participate include shadowing a local leader, attending local judicial trials, and observing a legislative session and committee meeting at the Capitol. Assignments include writing letters to the editor, interviewing local leaders, and volunteering for non-profit or community service organizations or political campaigns. Agents from all over Michigan are serious about taking action in their communities. And much to our delight, most are promoting LEAD to their friends, Christian schools, and youth groups. The Ambassador League provides the framework for LEAD alumni to put what they learned into practice, and they’re doing it! Dear Parents, it is our desire you are aware of the requirements of the program before your student signs up. This practicum is designed to push students out of their comfort zone, out of their sphere of relationships, and into their community. We believe that when students are given high expectations, they tend to rise to meet and sometimes exceed them, and therefore we encourage parents to be involved, but not to “do the work” for their student. Your child will be partnering with a mentor over the course of this program. Anyone other than a family member can be a mentor, but this person should be someone who will help keep your student accountable and stay on track throughout the year. Many mentors also read through their student’s papers and give writing advice before reports are sent in. Basic writing skills are required for this program. Depending on which level of achievement your student is aiming toward, between nineteen and thirty 550-word reports will need to be submitted. If your child struggles with writing, you may want to give some time for development in that area before registering your student. Several of the assignments require students to be mobile, thus if your student does not have a driver’s license yet, be aware that one-third of the requirements will require a means of transportation. We hope that through this program we will be able to help your child develop his or her God-given leadership and better understand his or her role as an Ambassador for Christ. The curriculum cost for Ambassador League is $50 per student. Please send payment to SSI, PO Box 80108, Lansing, MI 48908, (memo: Ambassador League). I have reviewed the sample Ambassador League list and give permission for my child to participate in the Ambassador League program. I understand that my child will receive a full Ambassador League packet detailing all of the program requirements. I further give permission to Student Statesmanship Institute to use a photo of my child and/or my child's oral and/or written comments in promoting SSI.